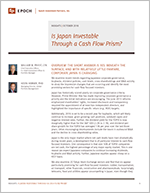 Is Japan Investable Through a Cash Flow Prism? - Epoch Investment Partners, Inc.
Is Japan Investable Through a Cash Flow Prism? We examine recent trends regarding Japanese corporate governance, buybacks, dividend policies, cash levels, cross-shareholdings and M&A activity to show the impressive changes that are occurring and identify the most promising sectors for cash-flow focused investors. Japan has historically scored poorly on corporate governance criteria. However, Prime Minister Abe has made improving corporate governance a priority and the initial indications are encouraging. The June 2015 reforms emphasized shareholders’ rights, increased disclosure and transparency, required the appointment of at least two independent directors, and highlighted the importance of specific return (e.g., ROE) targets. Additionally, 2016 is set to be a record year for buybacks, which will likely continue to increase, given growing cash positions, subdued capex and negative interest rates. Further, the dividend yield for the TOPIX is now marginally higher than for the S&P 500 (2.2% vs 2.1%), and dividend-per-share growth for the TOPIX has averaged 13% per year over the last three years. Other encouraging developments include the boom in outbound M&A and the decline in cross-shareholding ratios. Japan is the only major market where net cash levels have risen dramatically during recent years, a development that is of particular interest to cash-flow focused investors. One consequence is that over 50% of TOPIX companies are net cash, the highest percentage of any major equity market. This is one reason we expect Japanese companies to continue increasing dividends, buybacks and M&A activity. Further, Japanese equities appear cheap on a P/CF basis. We also examine 20 Tokyo Stock Exchange sectors and find that six appear particularly promising for cash-flow-focused investors: rubber, transportation, air transport, other financials, construction and pharmaceuticals. Surprisingly, telecoms, food and utilities appear uncompelling in Japan, even though they are typically among the most promising sectors for yield-focused investors in other major markets. However, we do not want to overstate the case for Japan. Policy remains muddled in the face of a formidably challenging macro environment. Corporate governance reforms are just starting to take hold and a majority of sectors appear essentially uninvestable through a cash-flow prism. Investment strategies that require tangible, multi-year evidence that progress is in fact occurring will justifiably demand patience. Still, recent developments suggest toning down one’s cynicism a notch, at least for the minority of sectors we have identified as promising. Buybacks are up 40% yoy among TOPIX stocks according to CLSA, which is doubly impressive given that 2015 was already a record year. Over 280 TSE companies have announced share buybacks so far in 2016, with a total announced value of ¥4.8 trillion. Over the last three years, buybacks have represented just under 1% of market capitalization (Figure 1). More pertinently, the median buyback announcement was for 1.9% of shares, comfortably above the 10-year average of 1.5%. Buybacks have been well received by investors, with a company’s shares typically outperforming the Topix by 3% (within a 2%-to-6% range) in the 20 trading days after an announcement. Also, over the past 12 years, actual buybacks have equaled or exceeded announced buybacks in every year except 2012 (and that miss was quite small). So announcements are a good guide to what is likely to occur. Finally, we believe buybacks will probably continue to increase, reflecting growing cash positions at many companies, subdued levels of capex and greater influence from the 2015 corporate governance reforms. During the last three years buybacks by TOPIX companies have averaged just under 1% of market cap initialization. In addition to a rising shareholder yield from buybacks, the dividend yield for the TOPIX is now marginally higher than for the S&P 500 (2.2% vs 2.1%), and dividend-per-share growth for the TOPIX has averaged 13% per year over the last three years. Further, dividends have tripled since 2000 (Figure 2), representing a moderately higher growth rate than that of the S&P 500, and a much stronger growth rate than that experienced in the U.K. and E.U. Further, the TOPIX payout ratio is a moderate 36%, with significant upside potential. Japanese dividends remain a manageable fraction of all earnings and cash flow measures, suggesting dividend-per-share growth is likely even if earnings shuffle sideways from here. The key risks to this view include: a top-line recession, an acceleration in labor compensation, and a dramatic increase in capex (which appears highly unlikely). TOPIX dividends have risen dramatically since 2000 and have averaged 13% annual growth over the last three years. The total yield is rising for the TOPIX, with the gap shrinking against the S&P 500’s higher, but flat-lining, yield. Another encouraging development is the ongoing surge in outbound M&A (Figure 4). During the last five years, 65% of Japan’s M&A was outbound (the other two categories are inbound and domestic). This figure is up from 15% during the 2001–2007 period and is about twice the global norm. Outbound M&A has boomed since 2011. Previous booms: late-1980s (Japan’s bubble), late-1990s (tech bubble), and mid-2000s (U.S. housing). As recently as the early 1990s, a majority of Japanese shares were held in cross-holding relationships. This reflected the historically dominant keiretsu model that was centered around the banks, trading companies and heavy industry arms of groups such as Mitsui, Mitsubishi and Sumitomo. Since then, both broad and narrow definitions of cross-shareholding ratios have declined to new record lows. This is an important development, as it allows for more arms-length transactions, better capital allocation and improved corporate governance. For example, the June 2015 reforms that emphasized shareholders’ rights, increased disclosure and transparency, independent directors and ROE targets, would have been unimaginable in the corporate structure that dominated just two decades ago. Cross-shareholding ratios (% of total market cap) are declining, albeit glacially, suggesting the keiretsu model has largely been unwound. Japan is the only major market where cash ratios have risen dramatically (Figure 6, grey line). This has occurred partly because capex in Japan has declined during six of the last nine quarters and remains well below its 20 year mean. Further, tepid growth in labor compensation has allowed firms to build up cash even in years when earnings growth was sub-par. We expect this cash accumulation to continue to drive strong dividend-per-share growth, more buybacks and further M&A activity. Cash balances have soared for TOPIX companies over the past three years, resulting in dramatically lower net debt levels. P/CF ratio of only 5.2. To dig a bit deeper, we examined 20 TSE sectors and found that six appear particularly promising, exhibiting a high dividend yield, strong dividend growth and supportive cash flow fundamentals. They are: rubber, transportation, air transport, other financials, construction and pharmaceuticals (Table 1). Six other TSE sectors possess high dividend yields, but appear to be less promising due to their challenging fundamentals: oil, securities firms, banks, wholesale traders, insurance and marine transport. Further, telecoms, food and utilities appear uncompelling from a cash-flow perspective even though they are among the most promising sectors for yield-focused investors in other major markets. These are the six most attractive sectors from a cash-flow perspective. A majority of the Tokyo Stock Exchange’s thirty-three sectors do not appear attractive based upon these criteria. *Dividend growth: Average annual dividend growth over the last three years.